Background: The Hetero-Diels-Alder reaction (HDAR) is a method extensively used in organic chemistry as a tool in the synthesis of innumerous polycyclic compounds in particular nitrogen compounds, presents in many natural products, medicinally relevant substances and organic materials. The literature describes innumerable studies of HDAR using classic methods and modern developments such as reactions on the solid phase, the use of catalysts, transformations in aqueous solution and under microwaves. 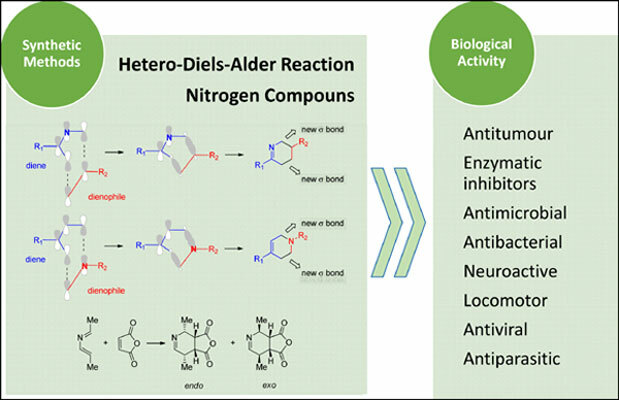 Objective: This review describes a variety of HDAR focused on obtaining nitrogen-containing compounds of considerable chemical and biological interest, and highlighting reported biological activity. Conclusion: This review has shown the importance of the HDA reaction as a tool of organic chemistry in the synthesis of nitrogen compounds. This type of reaction presents important properties including bond-forming economy, high regio- and stereoselectivities and thus provides highly efficient routes to access a wide range of polycyclic compounds. In addition to the variety of nitrogen compounds synthetized successfully by this method, they present relevant biological properties. Keywords: Hetero-Diels-Alder reaction, cycloaddition, nitrogen compounds, synthetic methods, biological activity, medicinal chemistry. Keywords:Hetero-Diels-Alder reaction, cycloaddition, nitrogen compounds, synthetic methods, biological activity, medicinal chemistry. Abstract:Background: The Hetero-Diels-Alder reaction (HDAR) is a method extensively used in organic chemistry as a tool in the synthesis of innumerous polycyclic compounds in particular nitrogen compounds, presents in many natural products, medicinally relevant substances and organic materials. The literature describes innumerable studies of HDAR using classic methods and modern developments such as reactions on the solid phase, the use of catalysts, transformations in aqueous solution and under microwaves.